Goal- and agent-oriented models are used in organization and information system modelling as a formalism aimed at providing intentional descriptions of processes as a network of relationships among actors. As such, they capture and represent goals, dependencies, intentions, beliefs, alternatives, etc., that appear in several contexts: business process reengineering, information system development, etc. In this paper, we are interested in the definition of a quantitative framework for the analysis of the properties that these models exhibit. Indicators and metrics for these properties are defined in terms of the model elements (e.g., actors, dependencies, scenario paths, etc.). Our approach is basically quantitative in nature, which allows defining indicators and metrics that can be reused in many contexts. However, a qualitative dimension can be introduced if trustable expert knowledge is available; the extent up to which quantitative and qualitative aspects are intertwined can be determined in every single case. We apply our proposal to the i* notation and we take as main case study a highly-intentional property, predictability of model elements. Franch, X. 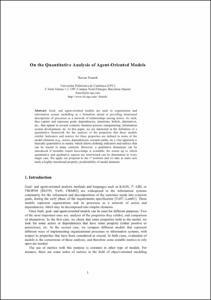 "On the quantitative analysis of agent-oriented models". 2005.